It is for situations where there are of being in many strangers, such as on the train, at the hospital, in the dentist's waiting room, smokey coffee shop, or an airtight airplane...Have you ever worried about about the air you breath? [Air Supply] is the first personal mini air purifier in the world that forms a strong ion barrier with in the breathing zone (around the face such as eyes, nose, and mouth), and can remove viruses, pollen, dust, mold bacterium, and cigarette smoke (*), etc. from around the face. U.S. and British government agencies have also adopted it for counter-terrorism use, and it is used all over the world due to its reliability and high air cleaning capacity. This mini personal air purifier weighs only about 60g which you will hardly notice. ■Elimiinated 95% of bacter in experiments. ■Four patents have been obtained the United States. It forms a strong ion barrier and removes floating (particulate) material around the face. 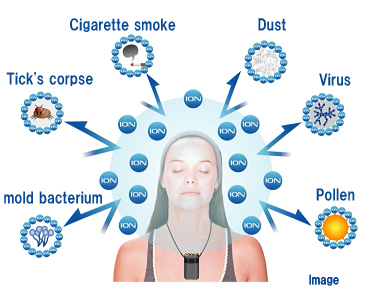 Personal air purifier [Air Supply] discharges 1.5 million pieces second/cm3 per ion and electrifies floating particles in the air such as, virus, pollen, dust, and cigarette smoke, and, removes it from the breathing zone (eyes, nose, and mouth). 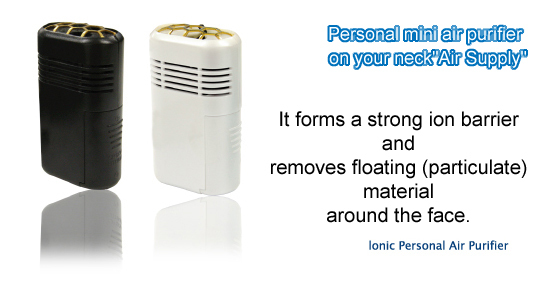 >Personal air purifier "Air Supply" can remove the float particles of 0.1-3 micron or less. Because it is not a filter type, troublesome maintenance and the replacement costs of filters are unnecessary. The entire face including the eyes is guarded when used together with a surgery mask, and the floating particles can be prevented from being inhaled more effectively. 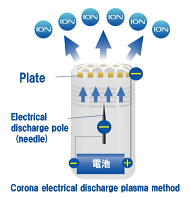 Generates high voltage in a needle shape electrode, and causes a corona discharge in the sink and at the point, generations a large number of ions. A large number of ions are discharged in to the air (breathing zone). 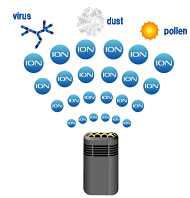 The ion is electrified the material such as virus, dust, that are floating. The barrier is formed, and the float particle is flipped. 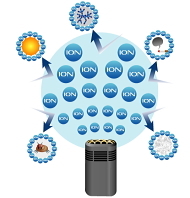 The floating particles are forced away from the breathing zone by the repulsion action of the ion discharged from Air Supply one after another. Marvelous power has been proven at research laboratories around the world. 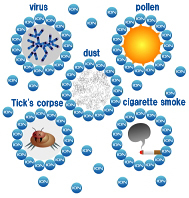 According to the result of a year of research at the Cincinnati University environmental hygienics part of the United States, it was proven that Personal air purifier [Air Supply] could remove floating particles that can be inhalated into the lungs such as, viruses, house dust, and cigarette smoke(*) in the air. Additionally, its high effect has been proven by many research laboratories such as UCLA Good House Keeping laboratories in Japan and U.S.
Inspecting organizationThe United States: University of Cincinnati, Southern California university, UCLA, and United States Andarraitarz laboratory, etc. 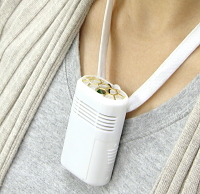 Personal air purifier [Air Supply] can be used in various environments. Besides wearing it around your neck, you can put it in a breast pocket, or on the desk while working or studying.Personal air purifier [Air Supply] can be used comfortably regardless of age, it is 20cm away from the mouth and nose and guards the breathing zone. It provides safe and fresh air all the time, especially works in airtight rooms (in the car, the classroom, and the office etc.). ■When you cannot put an air cleaner in each room. ※The effect will be less in situations in where it is used in the wind, outdoors. It is a powerful Personal air purifier that is compact easy to use, which has been proven by the Wein Products company's repeated research and development of the "Corona electrical discharge plasma method" for ten years. At the same time, a lot of new technologies have been obtained in the United States, and applied in Japan. It is a one-of-a-kind product that other manufacturers can only imitate.